It's August and I'm sleepy. Learned some Kung Fu last night, never thought that would be something I would do...we shall see. Kinda random I know. On a side note...If you linked up yesterday you might have seen a video....This video...I am working on it and I am so excited!!! I know it's not much now...ok actually it isn't really anything now, but JUST WAIT1 Thank you for the awesome links yesterday, guys, seriously....one of my favorite things to do is to go though each one and read each of your posts...this has also caused a tad bit of insomnia, but all worth it. I'm off to my next appointment, have a great day! EDIT: It's not too late to link up!! to Thrifters Anonymous! So get on it! OMG, Shana, I love this colorblock!!!!!! you look perfect! Can I have everything you're wearing?!....please! missed reading your blog girl!! Fantastic color combination, they work together perfectly! 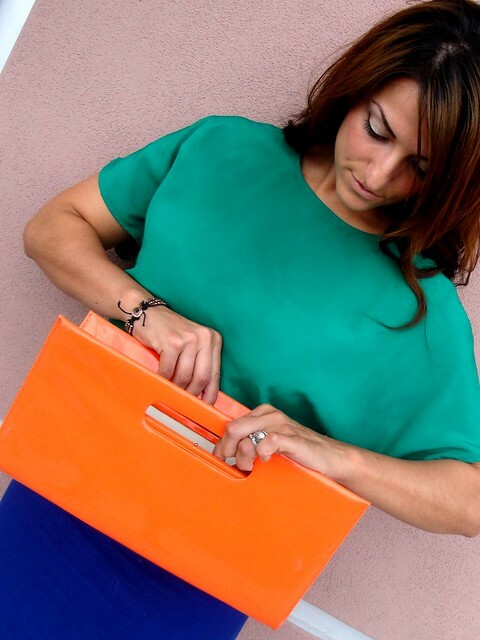 Colorblocking looks fabulous on you! I'm with you, need to go ahead and get it out of my system before it's not chic anymore (just tacky) haha, but seriously, those colors are beautiful on you and i absolutely love your hair! You pull off color blocking so well and I seriously lovvvve your hair! You look fabulous!! 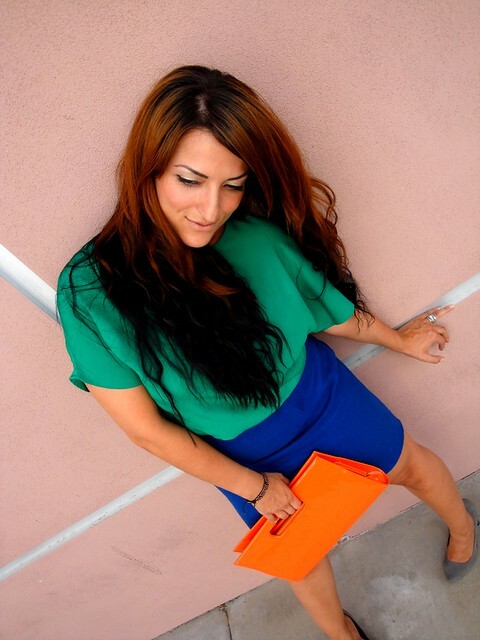 LOVE LOVE the colors ..that royal blue pencil skirt is such a pretty color! Well done! I love those two colors together! I would have never thought of that combo... but you pull it off !!! I am having a giveaway at my blog-- come check it out! Have a good day! This is an amazing take on the colorblock trend. I love it and you look great. Wow this outfit is great!! I love the blocking of the colours and the colours you have used. Great color block girl! You look great! -C.C. 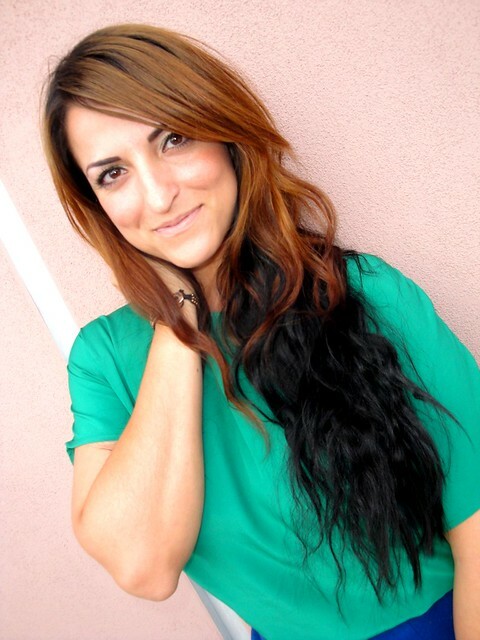 Shana, I love what you did with your hair! It looks so good on you. As does that top. It's my favorite top that I've seen on your blog. Actually, it's my favorite out of all the blouses I've seen in every blog. No joke. It just looks so comfy, soft, versatile, and pretty of course :) I could totally see myself wearing it over and over again hahaha! Beautiful as usual! Love how you styled this outfit. You posing is killer as well. Shana from the block! I love that hair. I need a hair intervention mine has been on snooze for the past year as I had to grow it out from a bowl cut. I must talk to my pregnant friend/stylist asap. I love those colors together. So gorgeous! I love this outfit, you are rockin' color blockin'! Love all the colors. You look amazing!!!!!! The purse is perfect. And oh... I just don't know what to say. I love it. i love those colors on you, gorg!! you are a thrifting QUEEN!!!!!!!!!!!!!!!!!!!!!! Wow I love this color blocking!!!!!!!!!!!!!!!!!!!!!!!!!!!!!!!!!!!!!!! the colors, the fabrics..WWWWWWWWWWWOOOOOOOOOWWWWWWWWWWWWWWW you are such an inspiraton!!!!!!!!! OMG LOVE LOVE LOVE this outfit. I am so adding you to my blogroll. I LOVE this color blocking! I think I need to try green and blue. This is one of my absolute favorite looks - green and royal blue [almost] always go together.